You might think that apartment buildings are a relatively modern development designed to accommodate a growing population, but the first apartments actually date back more than 2,000 years to the Roman Empire. These structures housed approximately 80 percent of the population, and they were eerily similar to many of today's buildings. According to We Are Apartments, more than 38 million Americans currently live in apartments, totaling more than the entire population of Canada. That number is split roughly 50-50 between single- and multi-person households. Together these residents generate spending power of $405 billion. 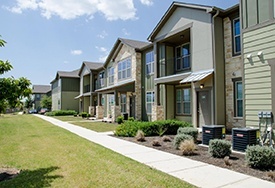 Apartment buildings make up a significant portion of the country's economy. The industry supports more than 1.5 million jobs for a total economic contribution of $190 trillion dollars. There's a sizable gap in apartment rates from state to state. Not surprisingly, at an average monthly rent of $1,793, New York tops RENTCafé's list of most expensive states. By comparison, an apartment in Kansas, with the lowest average of $614, is an absolute steal. In general, rent prices are actually in inverse proportion to apartment sizes. Nearly all of the top 10 states with most expensive rents are also in the top 10 of smallest average apartment size. At an average of 1,019 square feet, apartments in Georgia are the most generously sized. Who says the tech boom is dead? San Francisco, in the heart of Silicon Valley, weighs in as the most expensive city with a whopping $4,700 per month median rent for a two-bedroom apartment. The minimalist trend combined with an uncertain economy has given rise to the development of micro-apartments. These units range from 250 to 400 square feet, but in New York City, where space is at a premium, micro-apartments can be as small as 100 square feet! The Pontalba Buildings in scenic New Orleans are known as the country's oldest apartments. Constructed in 1850, the buildings include features based on the original decor, and in 1974 the Pontalbas were added to the National Historic Landmarks register. One-quarter of apartment residents are under the age of 30, but the balance is beginning to change thanks to Baby Boomers who are choosing to downsize as kids go off on their own. 2M Apartments in Washington, D.C. may be the only community with a mascot! Emmy is an adorable English bulldog who lives in her own "apartment" and is available for walks and snuggles with the other residents. How high is up? Aqua in Chicago is a mixed-use building that rises 859 feet for a total of 85 floors. Retail shops and office buildings fill the first 18 floors while apartments take up floors 19 through 52, leaving the remaining floors for condominiums and penthouses. Here's one more fact: customer satisfaction is goal #1 at our Springs luxury apartment communities. Learn more from our on-site management teams.